Lee Jamieson has a M.A. in theater studies and is the author of numerous books. He lectured for six years on theater studies at Stratford-upon-Avon College in the U.K.
Who was William Shakespeare’s immediate family? Did he have children? Are there direct descendants around today? William led two very different lives. There was his home, family life in Stratford-upon-Avon; and there was his professional life in London. Other than one account from a town clerk in 1616 that Shakespeare was in London with his son-in-law, John Hall, there is no evidence that his family had much to do with London. All of his property was in Stratford, including a large family home called New Place. When purchased in 1597, it was the biggest house in the town! There is no exact record of when John and Mary married, but it is estimated to be in about 1557. The family business evolved over time, but it is widely recognised that John was a glove maker and leather maker. John was very active in Stratford-upon-Avon’s civic duties and in 1567 he became mayor of the town (or High Bailiff, as he would have been titled then). Whilst there are no records, it is presumed that John’s high civic standing would have enabled the young William to study at the local grammar school. Infant mortality was common in Elizabethan England, and John and Mary lost two children before William was born. The siblings above lived until they were adults, with the exception of Anne who died at the age of eight. When he was just 18 years old, William married 27-year-old Anne Hathaway in a shotgun wedding. Anne was the daughter of a farming family in the nearby village of Shottery. She fell pregnant with their first child outside of wedlock and the couple had to obtain special permission from the Bishop to marry. There is no surviving wedding certificate. The child conceived out of wedlock to William Shakespeare and Anne Hathaway was daughter named Susanna. A few years later, they had twins. However, in the summer of 1596, Hamnet died, aged 11. It is thought that William was grief stricken and his experience can be read in his characterisation of Hamlet, written not long after. Susanna married John Hall in 1607; Judith married Thomas Quiney in 1616. William had only one grandchild from his eldest daughter, Susanna. Elizabeth married Thomas Nash in 1626, and later remarried to John Bernard in 1649. From William’s youngest daughter, Judith, there were three grandsons. 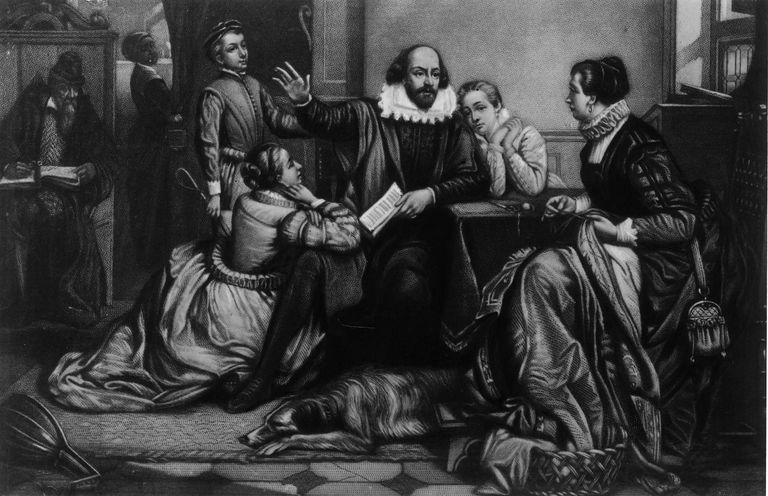 The eldest was named Shakespeare because the family name had been lost when Judith married, but he died in infancy. Above William’s parents in the family tree, information becomes a little sparse. We can’t be sure of the names of William’s grandmothers because the “men of the house” would have taken control of legal affairs, and so only their names will have appeared on historical documents. We know that the Arden’s were wealthy fathers and the Shakespeare family held civic responsibilities in the town. It is likely that this combined power was what enabled them to obtain special permission from the Bishop for their children to marry to stop the baby being born out of wedlock; this would have brought shame on their family and their reputation at the time. Wouldn’t it be great to discover that you are a descendant of the Bard? Well, technically, it is possible. The direct bloodline ends with William’s grandchildren who either did not marry, or did not have children to continue the line. You have to look further up the family tree to William’s sister, Joan. Joan married William Hart and had four children. This line continued and there are many of Joan’s descendants alive today. Could you be related to William Shakespeare? Where Was Poet and Playwright William Shakespeare Born? What Was Shakespeare Doing During His Lost Years? What Are Some Facts About Shakespeare's Death? What Was Shakespeare's School Life Like? Who Wrote William Shakespeare's Plays?